Associate Professor Jayan Thomas works in the NanoScience Technology Department at the University of Central Florida. He’s been researching nano-architectured energy conversion and storage devices. 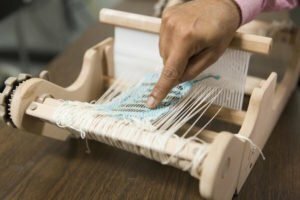 The filaments that Dr. Thomas has created will be able to be woven into textiles, where they can harvest and store solar energy in batteries. Wearables could see an exponential growth and be revolutionized by this technology—if we can get the storage part down. The promising tech out of Thomas’s lab is a ribbon-like device that has the capability to capture and store energy simultaneously. The material is weave-able and very flexible, which is ideal for clothing and other textiles. Thomas’s design combines a supercapacitor and a solar cell inside the copper ribbon as opposed to using them in two separate devices. The solar cells generate electrons on one side of the ribbon and transfer them to the other side, where they are stored in the supercapacitor. These filaments can be intertwined throughout your winter coat, t-shirt, or any other piece of clothing to power a variety of things. For everyday purposes, you could charge your phone off of this system. But this tech could be used in a variety of ways, including military applications. If the military can reduce the sometimes more than 30 pounds off of a soldier’s back by removing battery packs, this would increase their endurance. Another application could be incorporating them into awnings over buildings’ windows and doors. If the material in the fabric of these awnings could store and capture energy, outdoor lighting and other appliances could be charged to reduce the amount of electricity drawn from the grid.